Desirable building lot on a peaceful road in the Community of Eastman, with easy access to the South Cove community building and all Eastman amenities. Eastman is a four-season intergenerational community surrounding an award-winning golf course and a 345 acre lake. Hiking and cross-country ski trails weave throughout the community, and 8 Har Tru courts provide a centralized location for tennis activities. The community building offers an activity room, fitness center, and indoor pool, so everyone always has something fun to do. 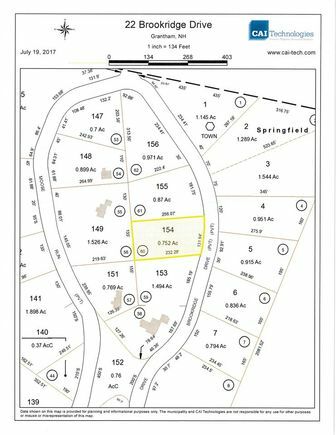 The details on 22 Brookridge: This land located in Eastman, Grantham, NH 03753 is currently for sale for $15,000. 22 Brookridge is a – square foot land with – beds and – baths that has been on Estately for 641 days. 22 Brookridge is in the Eastman neighborhood of Grantham and has a WalkScore® of 3, making it car-dependent. This land is in the attendance area of Grantham Village School and Lebanon High School.